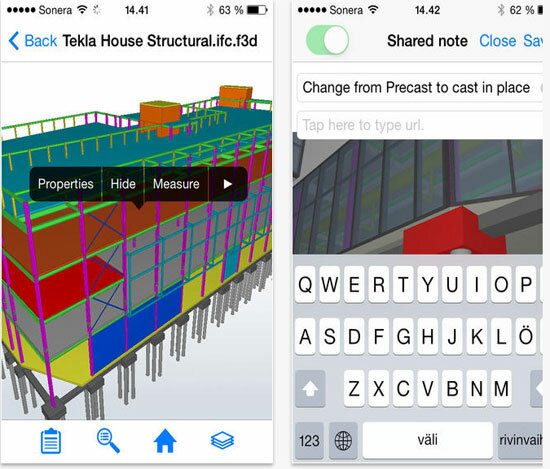 Tekla Field3D is a simplified high performing IFC & BIM 3D collaboration software useful AEC professionals to accomplish their project through iOS mobile gadgets. The BIM professional can go with this tool to deal with outsized data sets and constructable, detailed models. By applying Tekla Field3D one will be able to collaborate with various project stakeholders devoid of accessing a desktop BIM software or having sound knowledge on 3D. Cloud repository in favor of project teams. Automatically syncs the data for models, notes and photos. 3D viewer plugin for PC browsers. The users can acquire Tekla Field3D as a standalone application through Apple App Store. The free version comes with essential functionality and the premium version includes a wide array of advanced features for more professional utilization. Interested buyers can send mail at mobile@teklabimsight.com to purchase the application.